The Ovente KP72 Series is an attractive, easy-to-use electric kettle that looks great on any kitchen countertop. With 1.7 liter water capacity and 1100-Watts of power, this handy tool can quickly bring water to a rolling boil in less than 6 minutes (at maximum level). In a matter of minutes, hot water will be ready to use for instant coffee, tea, hot cereal, instant macaroni or oatmeal. It is proven to be 50% more efficient than traditional stovetops in reducing your daily electricity use. The kettle has a concealed water heating element, so there are zero traces of objectionable mineral deposits such as nickel (a common allergen) found in your drinking water. It also comes with a removable/washable spout filter to ensure the purest results. For convenience, this kettle features a flip-back lid that opens with just one touch for easy filling and cleaning. For safety purposes, it’s equipped with Automatic Shut-Off upon boiling, and Boil-Dry Protection which automatically shuts off the kettle when no water is in the carafe. Additionally, it comes with a secure locking lid, blue LED indicator light, cool-touch button and comfortable stay-cool handle. It’s also easy to store—its 30 inch cord wraps neatly into its base. Note: Electric kettles may reach boiling faster at higher altitudes due to the fluctuation of boiling points. Because of this, the kettle may not shut off on its own. 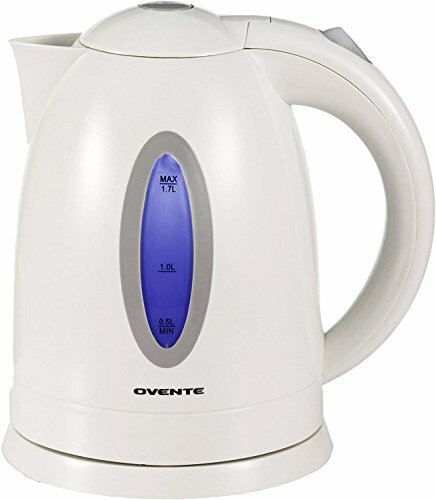 FAST & ECO-FRIENDLY - The Ovente BPA-Free Plastic Cordless Electric Kettle with Stainless Steel Interior boasts 120V, 1100-Watt power and a 1.7-Liter capacity that boils water faster while using far less energy than stovetop kettles. PURE, CLEAN WATER - A concealed heating element prolongs the kettle's life compared to an exposed heating element which deteriorates faster. It also maintains an attractive aesthetic and keeps harmful metallic chemicals away from your drinking water. EXTRA SAFE - It features Automatic Shut-Off and Boil-Dry Protection Technology to prevent accidents. Its ergonomically-designed handle stays cool, making filling and pouring of water safe and fool-proof. EASY TO CLEAN - Removable/washable spout filter guarantees that you'll always get the freshest, cleanest results. To deep clean, simply mix 3 tbsp vinegar or lemon with water, boil, then let sit for a minimum of 5 hours. COLORFUL, ATTRACTIVE, PRECISE - The Ovente KP72 Series comes in a variety of eye-catching colors: Baby Pink, Green, Brown, Pink, and White. It also features an blue on/off LED light indicator and a clear water level gauge for precise measurements. Electric kettles may reach boiling faster at higher altitudes due to the fluctuation of boiling points. Because of this, the kettle may not shut off on its own. Note: Before first use, fill the kettle to its maximum capacity, bring to a full boil, then wait until the indicator light turns off before using. If you have any questions about this product by Ovente, contact us by completing and submitting the form below. If you are looking for a specif part number, please include it with your message.